Forty chapters are included in this volume. Anatomy and physiology of the auditory and vestibular systems, the Eustachian tube, and the facial nerve are discussed in detail, along with evaluation of auditory function and disorders. The specific otologic and neurotologic disorders covered include cholesteatoma, otosclerosis, sensorineural and occupational hearing loss, vertigo, schwannomas, facial nerve paralysis and tumors, and many more. Separate chapters discuss about aural rehabilitation and hearing aids, implantable middle ear and bone conduction devices, cochlear and auditory brainstm implants, and molecular therapies. 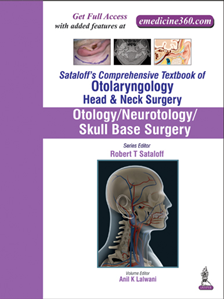 This volume is a thorough guide geared towards practicing otolaryngologists and otolaryngology residents, and fellow performing otologic and neurotologic surgery.